Hi, I am the spunky new kid on the block. My name is Baloo. I am a 7 month old who currently weights in around 70 lbs. I love all things and will make a great family pet. I am great around other dog and love playing with kids. 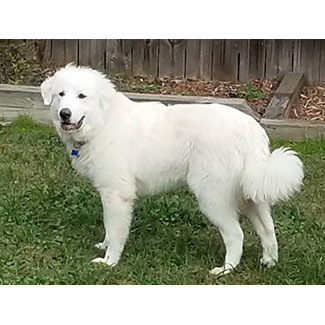 Just like all the other pyrs, I will be a big boy and need to have a home where I get plenty of exercise and training so that I do not become the neighborhood terror. Do you think I would fit perfect in your home? Contact GPRA today for more information at info@greatpyratlanta.com.